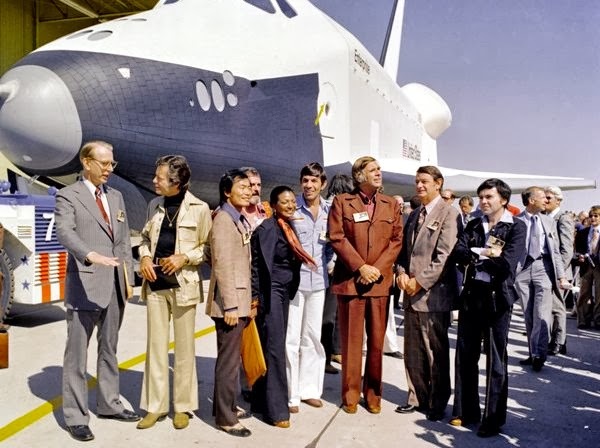 On this day (Constitution Day in the United States of America to mark its ratification in 1787) in 1976 President Gerald Ford christened the Space Shuttle Enterprise, named in response to an overwhelming Trekkie (“one of the most dedicated constituencies in the country”) letter campaign and the event was attended by the creators and cast of Star Trek. Like the NCC-1701, it was not originally designed for spaceflight with no heat-shield for atmospheric re-entry (absent the expository device of a teleporter), the test vehicle was an important stepping stone to improve next generation vehicle engineering, famously piggy-backing aloft on a Boeing 747 to bring it to attitude and speed and testing its gliding maneuvers. The Enterprise was later retrofitted and flew missions in support of Skylab.